Don’t Miss Part 1 of my review. As far as electronics–Costco has all sorts of great stuff. Cameras, TVs, computers, tablets, phones and accessories like flash drives and portable harddrives. They occasionally have other electronics, like for a while around Christmas, they sold the Parrot AR Drone helicopter. 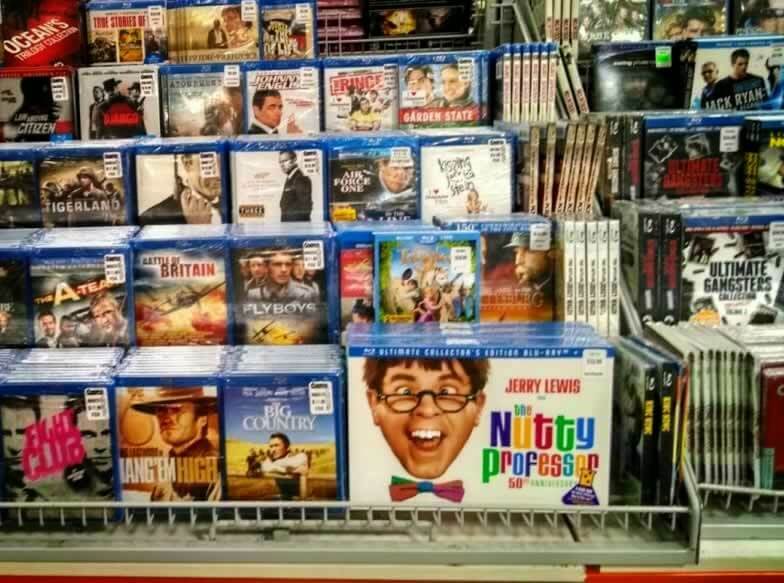 If you’re just shopping by price, you might not realize that you’re looking at a bargain. Generally Costco gives you much more for your money than you would get from Amazon or some other retailer for about the same price. 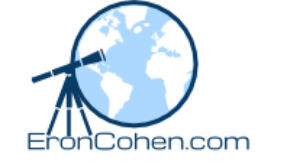 For instance if you bought an SLR camera from Costco such as the nice Canon Rebel or Nikon D5300 that they sell, the price might be about the same as elsewhere. The difference is that your purchase might, for example, come bundled with a case, an extra lens and a memory card that you’d have to buy separately at some other venue. Again you never know when the electronic device you saw at Costco will disappear, so if you see it, get it while you can (you can always return it). Speaking of cameras, photo printing at Costco is very cheap. One hour photos of all sizes are available. You’d be shocked to know you can buy a nice quality 20×30 poster for $8.99. 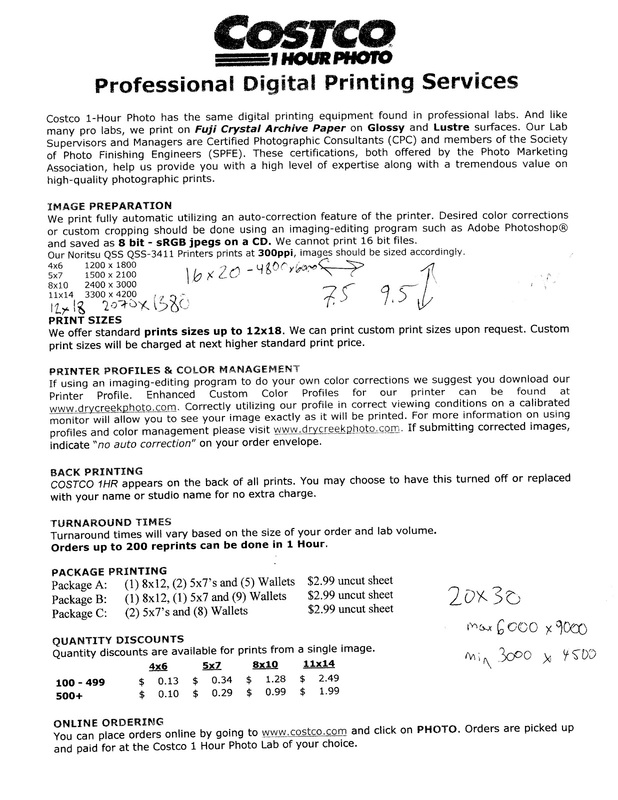 Regular sized photo prints (4×6) are 13 cents. 8x10s are $1.49 cents. You can upload your photos on the Costco website or even just use a machine right at the photo area in Costco. When you order online you can choose to print them at your local Costco or they will mail them for a fairly reasonable shipping rate. PRO TIP: If you are a professional or prosumer photographer who uses Photoshop or Fireworks or gimp to resize your photos and edit them, the chart to the right below will come in handy for knowing the right dimensions for your pictures so you don’t have to be concerned about cropping. Costco also offers photobooks and other alternatives to paper prints. You’ll have to order them and wait for them to be sent though–no one hour photobooks. 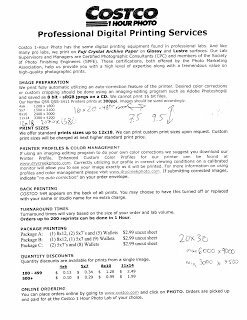 Costco’s photo center also offers ink jet print cartridge refills. This is a good deal at less than $10 per refill when you compare it to the cost of purchasing a new ink jet cartridge. If you’re looking for healthy food, you won’t find much of that at the Costco food court. You will definitely find unusually low-cost food, and in the genres of food offered, you’ll find it to be of good quality. I hope Costco will improve on this by offering high quality, healthier options. Probably the most popular offering is the $1.50 beef hot dog and drink combination…or maybe the huge $1.99 slice of pizza is most popular (I believe whole pizzas-also huge-are $9.99) As pizza goes, they use a generous amount of cheese and toppings and give you an extra large slice. I don’t know what ingredients they use, but probably better quality than standard pizza places. Nevertheless, it wouldn’t surprise me if they’re using genetically modified ingredients. Probably the healthiest thing they offer is the chicken Cesar salad…but even that has the caveat of being a relatively high calorie item when you factor in the portion size and salad dressing. PRO TIP: If you want to save some time and you know what you were going to order, you can just tell the cashier when you checkout with your food and regular items. You’ll then just show your receipt to the cashier at the food court. PRO TIP: If you plan to take your pizza to go, you are going to likely find out that the only way to get a box is to order an entire pizza. Otherwise, you’ll find yourself with a paper plate and a tin foil covering…not a great situation. On the other hand, since whole pizzas a so cheap if you’re getting more than 2 slices, it might just be worth it to get an entire pizza instead. Costco sells a variety of men’s, women’s and children’s clothing. Their offerings include dress shirts, jeans, athletic shoes, underwear, t-shirts, camisoles and dresses. 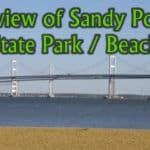 They also offer seasonal clothing and accessories such as Halloween costumes and sun hats in the summer. As with everything at Costco, brands and specific offerings come and go, but I have recently seen Docker pants and shorts and Gloria Vanderbilt jeans, for example. They also tend to offer the Kirkland brands. 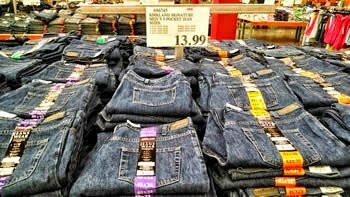 For instance in the photo they are selling men’s Kirkland jeans for $13.99 in a variety of sizes. They also have Kirkland men’s athletic shoes for $16.99. 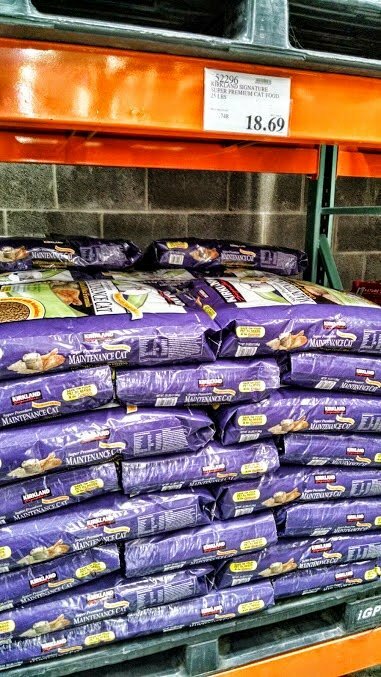 Costco offers dog and cat food as well as some occasional pet supplies such as dog beds, heart worm medicine and chew toys. Brands will vary but for instance they have Fancy Feast cat food and the Kirkland brand dog food/cat foods. Buying pet foods in bulk is clearly cost effective. Pictured is 25 pounds of Kirkland premium cat food for $18.69 cents. So for about 75 cents/pound you get some pretty decent cat food. Obviously, you’ll need to have a place to store such a big bag of food but many people keep in in their garage or some other out-of-the-way place and then just scoop it into a smaller container that they keep handy. BTW, I have also seem some pretty cool crafts made out of the huge/sturdy bags these foods come in. They also sell a 42 pound bag of Scoop Away brand kitty litter, cat toys, and dog toys. I don’t have dogs, but I have been told that the dog food product seems to be better than average and is well liked by my friend’s dog. They also offer bulk bird seed. There are some fantastic deals on tires from Costco. They’re installed and included nitrogen fill, rotation, and road hazard insurance. The price offsets the inconvenience of the tire service there. I love the tires, I love the price, but the last 3 out 4 times I’ve been there recently, I’ve waited in line over half an hour (one time close to a full hour) to drop off or pick up my car. PRO TIP: Double check the tire center hours. At our Costco in Columbia, Md, the tire center opens at 7am–way before the actual warehouse opens, 7 days a week. Most people think the hours are the same as the warehouse, so if you get there early in the morning you may be able to avoid some wait time both for purchasing the tires and for having them put on. By all accounts, Costco’s pharmacy is the way to go for any and all medications. Their generic brands are exceedingly cheap, and the service is quite good–they even offer the ability to refill your prescriptions by mail–you can order them online. Most locations have a pharmacy, and in fact, in many states (as required by law) you don’t even need to be a Costco member to use the Pharmacy. You can view the base-price for some prescriptions using their online drug information and pricing tool (you would have to know your insurance company’s policies to know how much you would actually pay if you are using insurance–they don’t give pricing for all prescriptions). They also have a special program Costco members can join to get even lower prices on medications. BTW, they also offer flu shots. Aside from gift cards for Costco itself (which can be used to purchase products or memberships). 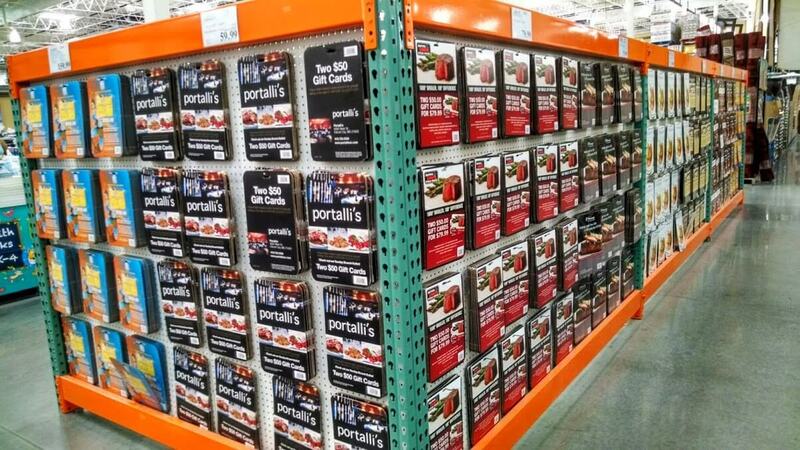 Costco offers a wide variety of discounted gift cards. Available cards vary from month to month and tend to come with decent cost savings-typically about 20% off the face value of the card. These include restaurants, entertainment and sporting venues. Examples would be $60 for $100 worth of gift cards to Portalli’s – a local restaurant. I have also seen gift cards to Starbucks, ski resorts, amusement parks, movie theaters, Ruth’s Chris Steakhouse, McCormick and Schmick (two $50 gift cards for $79.99), Bertucci’s and Cirque de Soleil ($200 for $159.99). Costco offers discounts on travel and other kinds of services. This includes things like gutter installation, air conditioners, high end water filters, counter tops, flooring and credit card processing for businesses. 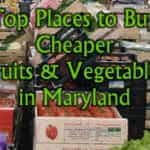 I have used the Costco travel, and I can say that they do offer great service and competitive pricing. For example, we got a great deal on a hotel and tickets to Universal Studios Orlando. You can book your travel yourself, but Costco has travel agents that are very helpful. As I’ve been saying, there is plenty to like about the available products and savings from shopping at a Costco store, but don’t forget about Costco.com...there are plenty of interesting things to buy there…everything from glassware to coffins for a funeral (apparently they can deliver them quickly to a funeral home and the funeral home is required to let you use it–who knew–just note that it is likely the funeral home will charge you a handling fee and often these are exorbitant because of course they want you to buy a more expensive one from them.). I have seen many times that Costco makes virtually no money on the products it sells. They do have some markup–probably about 10% over what Costco pays, but by the time they pay their expenses, that money is gone. Where they do make money is from membership fees. When I compare Costco to Sams, I would say that there is quite a bit in common. The man who came up with Costo was originally the founder of Price Club–so he sort of started the wholesale warehouse business. In general I would say that Costco tends to have healthier foods available. Prices seem to be very comparable though. I haven’t got any experience at all with BJs, but I do have family members who love that place. Yet another great reason to love Costco is that its employees make much more than minimum wage and they get some benefits. The average employee at Costco makes over $20/hour. This isn’t common in the big stores, so it is great that they treat their employees well. They also tend to hire within–meaning that many of their managers started off working at cash registers and stocking the shelves. Need to know how to become a member of Costco? That’s easy–just walk in through the door marked “EXIT” and go up to the customer service desk. Aside from the above mentioned $110 executive membership, there is also the regular membership that costs $55. They will give you information, a current costco coupon book and of course two Costco Store membership cards. (They require that each card recipient be there to have their picture taken–if both parties can’t be there, you can always give them the name of the second person who can come by Costco at their leisure to get their card.) Don’t forget about the Citi Visa Credit Card when you join–makes good deals even better. BTW, you’ll look forward to receiving Costco coupon books in the mail. Most of the discounts are taken in store and don’t actually require you to clip a coupon. 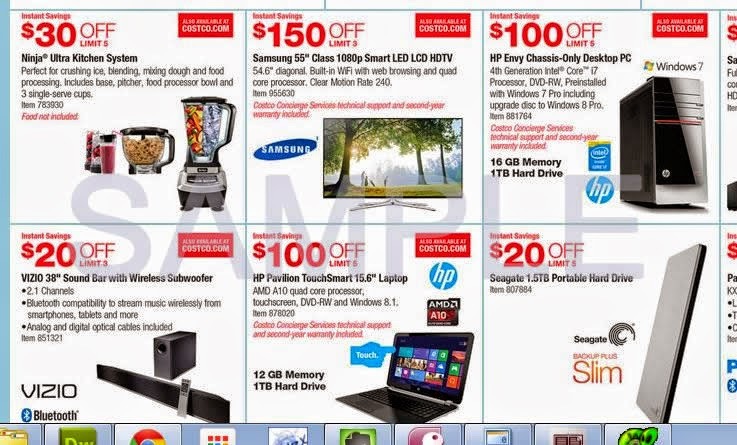 The coupons are also available on the Costco Website. Note that there are also certain products that you can get in the stores that come with instant rebates that may not be mentioned in these coupon books. Also, there are certain things that are seemingly always on sale such as vitamins, mobile phones and tires. 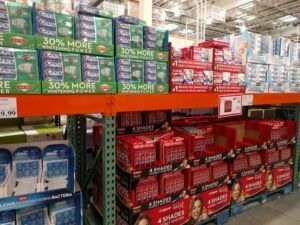 Shopping at Costco has been a great way to get quality foods and other merchandise while saving money. For other easy money saving ideas, see my other posts in this series: Changing your electricity Provider, Ditching Your Home Phone, Changing Your Mobile Phone Provider and Getting rid of cable TV and instead getting your television shows over the internet. 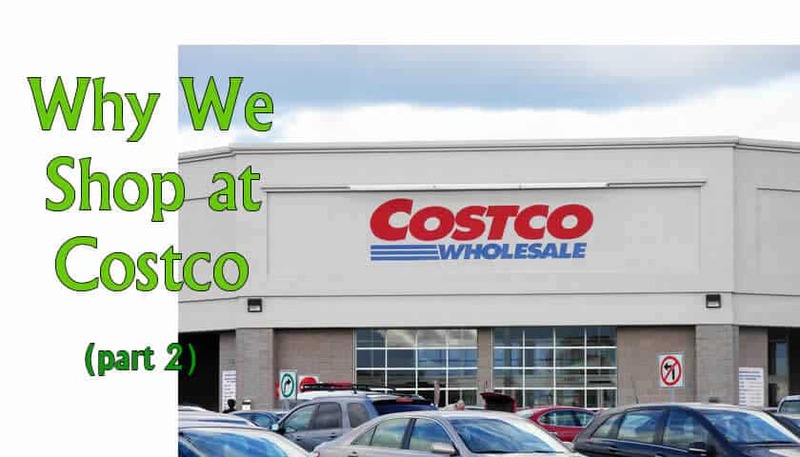 Don’t Miss Part 1 of my Costco review.